The stuff that turns up in my inbox rarely delights me. This did. Long time readers will know I want to see more roundabouts here. Not Traffic Circles. If you haven’t been following along here’s a bunch of posts on that theme. 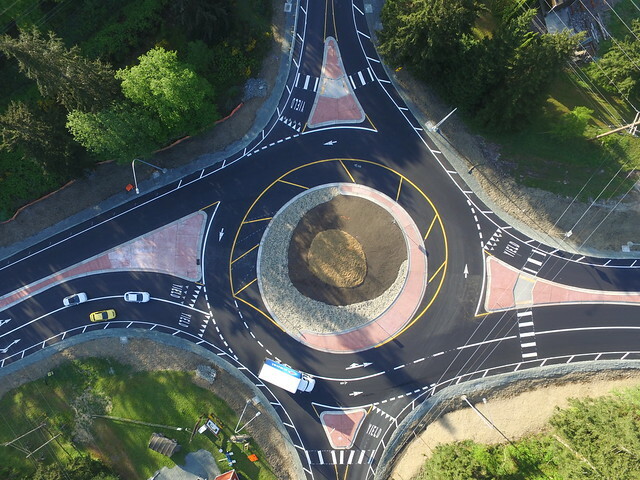 Next Thursday afternoon (Nov. 17) the city of Carmel, Indiana will celebrate the opening of its 100th roundabout, giving the city far and away more of these European-style intersections than any other community in the United States. Increasingly, cities are yanking their traffic lights in favor of European-style roundabouts. They’re doing it for reasons that range from cost savings and traffic flow to safety and the environment. As many as four times the number of cars move through a roundabout in the same time as a traffic light, and yet the number of injury-related accidents goes down by an astonishing 80%. 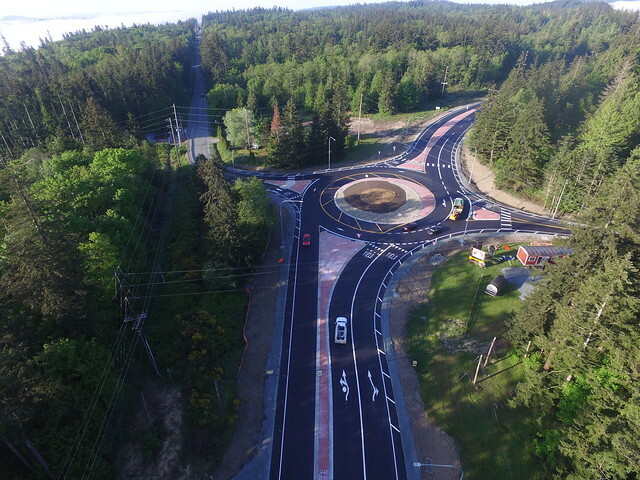 And because cars are not idling in long lines before launching again, each roundabout typically saves thousands of gallons of gasoline per year. Championing these and other environmentally friendly developments in Carmel has been Jim Brainard, the city’s long-time Republican Mayor. Labeled by one publication as a “rogue elephant,” Brainard was one of only four Republicans to sit on a large White House task force for climate change. It’s a position that puts him at odds with many in his party — including, now most notably, the President-elect and his running mate, who of course is also Governor of his state. The Mayor argues that concern for the environment has historically been a core Republican value. And he’s supported strongly by his own constituents — overwhelmingly Republican and generally conservative — who last year elected him to his sixth four-year term. Several years and dozens of roundabouts ago, CNN did a piece on Carmel’s roundabouts that you may find interesting. Also, just a couple months ago the UK-based Roundabout Appreciation Society named one of Carmel’s roundabouts “Roundabout of the Year,” including it in its annual calendar. I love roundabouts and low flowers or greenery in the center is just fine, however in Abbotsford the city has planted very high shrubs that block the view of traffic in the roundabout. I’m not convinced that this is a good plan as it gives only a few seconds to know when to enter.